Ascended Master Portia. Over 2000 Advanced Energy Workshops for Spiritual Evolution. You are the I AM Presence in Embodiment! Ascended Master Portia is the Goddess of Justice and Opportunity. Ascended Master Portia radiates Divine Light and Divine Love to all humanity! Ascended Master Portia lives in the divine city of Shamballa. Ascended Master Portia will not incarnate again and her stated goal is to aid ALL beings in their individual journeys to enlightenment. Ascended Master Portia is the Chohan of the Seventh Ray of ceremonial order and magic. She is currently responsible for bringing divine justice to her Adepts. Importantly, Ascended Master Portia anchors the 3 fold Violet flame of transformation within the hearts and minds of all humanity. Ascended Master Portia is one of the Lords of Karma. 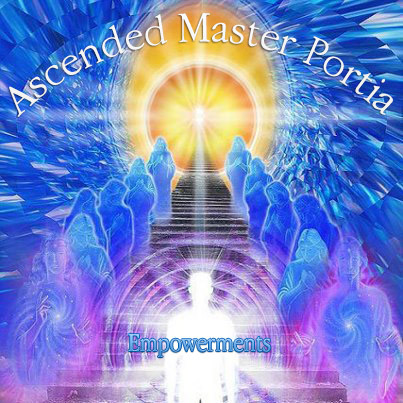 You will receive the Ascended Master Portia - Manual via Email, 4 Attunements and a emailed certificate. Plus full email support is given before, during and after all my Workshops.